Disaster can strike at any time! In Havelock and around the Marlborough Sounds generally, extremes in the forces of nature can, from time to time, cause us inconvenience, damage to property - and even personal harm. We can experience heavy rain which causes flooding (at worst on the high tide) and brings down slips from our steep sided terrain - this occurred just after Xmas 2010, isolating Havelock and devastating Wakamarina/Canvastown. We get gale force winds which knock down trees - and we can experience some pretty decent summer bushfires from time to time. Typically these situations are well managed by our emergency services, disruption to lifeline services is brief and things quickly return to normal for most of us. However the greatest potential threat to our community from nature, one which will almost certainly involve major, long term disruption, damage and injury - is earthquake. Here in New Zealand we're living astride the boundary of two massive tectonic plates, pieces of the Earth's crust which are in collision with each other. 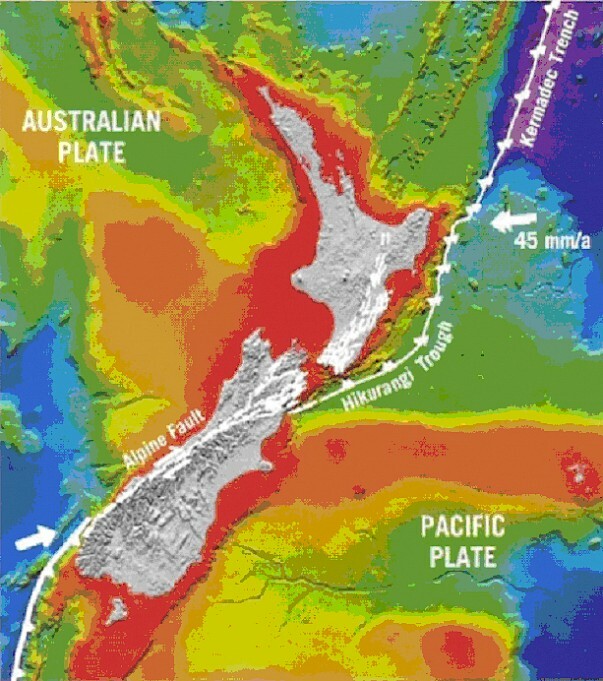 To the north and east of Marlborough the force of this collision is driving the Pacific Plate down and under the Australian Plate, and at the bottom and to the west of the South Island the reverse is happening with the Australian Plate being forced down and under the Pacific Plate. This process is called 'subduction', and it results in tremendous energy building up over time, ultimately released as very powerful earthquakes. Christchurch experienced a 7.1 quake on September 4th 2010, and aftershocks continue to the present. Before this event in July 2009 there was a 7.8 magnitude earthquake in Fiordland. The last major earthquake in the northern subduction zone was the 1855 Wairarapa earthquake - this measured 8.2 on the richter scale and devastated the Wellington region. Right in the middle of these opposing subducting forces is a transition zone - we know this as the Southern Alps or alternatively the Alpine Fault, and this very beautiful mountain range is the surface expression of tectonic plate collision. Along this fault, earthquakes release collision energy every 300 years or so, resulting in a lateral movement of about 8 meters, and a mountain building vertical movement of about 4 meters - over a distance of 400 kilometers. The last great earthquake on the Alpine Fault occurred in 1717 - so we're due for the next one! This will most likely be centred near Whataroa in South Westland and will be felt here at a magnitude of about 6 (+/- 0.5). The northern most section of the Alpine fault is the Wairau Fault and it is also thought to be primed for rupture. Ultimately it doesnt matter where an earthquake is centred or which fault ruptures, potential exists for serious damage to us and our community. What happened in Fiordland and Christchurch, Samoa in September 2009 or Chile in February 2010 could just as easily have happened here. For this reason Havelock Civil Defence encourages everyone to be prepared for a large earthquake, or any other natural disaster, to the extent that they can be. Satellite image of New Zealand outlining the collision boundary of the Pacific and Australian Tectonic Plates.